"I guarantee that you will receive rave reviews on Thanksgiving Day with this recipe! Garnish with fresh thyme, rosemary, and bay leaf. 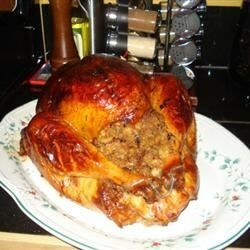 The turkey is stuffed with Awesome Sausage Apple and Dried Cranberry Stuffing." Melt 6 tablespoons butter with canola oil and tangerine juice in a saucepan over medium heat. Remove from heat, and allow to cool about 5 minutes. Soak a piece of cheesecloth large enough to drape over the turkey in the mixture. Preheat oven to 425 degrees F ( 220 degrees C).Clean turkey, and season body cavity with salt and pepper. Loosely pack the neck cavity and body cavity with stuffing. Tie drumsticks together, spread 6 tablespoons butter over the turkey, and season with salt and pepper. Place turkey in a shallow roasting pan. Roast turkey for 25 minutes in the preheated oven, and then arrange soaked cheesecloth over turkey. Reduce oven temperature to 325 degrees F (110 degrees C). Continue roasting 1 hour. Leaving the cheesecloth draped over the turkey, baste with the tangerine juice mixture. Continue roasting about 2 hours, basting occasionally, until the internal temperature of the thickest part of the thigh reaches 180 degrees F (80 degrees C) and the stuffing inside the body cavity reaches 165 degrees F (70 degrees C). Discard cheesecloth, and place turkey on a serving platter. Allow turkey to cool about 25 minutes before carving. Skim fat from pan juices, and reserve 1/4 cup fat and skimmed pan juices. In the baking pan, mix pan juices with 1 cup turkey stock; cook over high heat, stirring to scrape the bottom of the pan. In a saucepan over low heat, whisk together reserved 1/4 cup fat and flour until thickened, about 3 minutes. Stir in pan juices and remaining turkey stock, and add neck and giblets. Simmer 10 minutes, stirring constantly, until giblets are cooked through. Strain through a sieve, and serve with the turkey and stuffing. Used this recipe for our very first Christmas turkey dinner (we're newlyweds). My mother-in-law was impressed. The directions, as written, are not that easy to understand though. It is indeed out-of-this world!!! Everyone loved it. This was the juiciest turkey that I have ever made and very tasty. Guests really enjoyed it.